Alfreton Town snatched defeat from the jaws of victory through poor defending as York City scored twice in the final five minutes to win 3-2. ﻿Alfreton squandered a golden opportunity to go 3-1 ahead of struggling York when Reece Styche smashed a 70th minute penalty so hard against the bar that the rebound set up a counter-attack to produce the visitors’ first corner of the game. 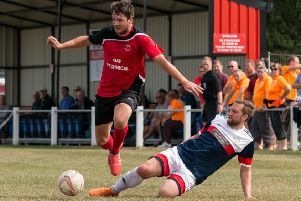 ﻿Styche had put the Reds in the driving seat with a 36th minute penalty and an angled drive in the 51st minute, after Sean Newton’s 11th minute opener for the Minstermen. York, heading for a ninth consecutive away defeat for the first time in 62 years, levelled in the 85th minute when Alex Kempster netted with an overhead kick. With two minutes remaining Martin Riley impeded Paddy McLaughlin and Jordan Burrow lashed home the penalty.